Evening Edition ---Pat Sloan’s Lecture & a Free Kindle Book! I just got back to my dorm room --- it was a great evening with an even greater lecture by Pat Sloan tonight – It’s so wonderful to be able to sit and listen to someone else and relax and enjoy! If you get a chance to listen to Pat speak – do NOT miss it! The woman is hysterical, and I learned things about her that I didn’t know. And on top of everything else I am really blessed to call her my friend. I am SO far behind in so many things, but all I want to do tonight is curl up and read. 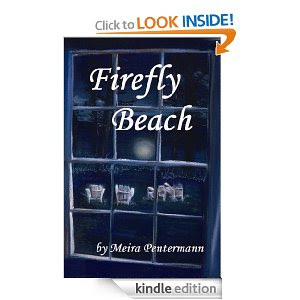 Firefly Beach by Meira Pentermann is free tonight in the Amazon Kindle Store. When Beth LaMonte rents a cottage on the coast of Maine, she wishes only to withdraw and paint. A mysterious ball of light disturbs her peace and leads her to a secret beach where she finds the diary of a girl who disappeared in 1975. Now Beth is on a mission, not only to bury her own past, but to put to rest the spirit of Firefly Beach. So there you have it --- download it while it’s still free and double check before clicking to make sure that it still is for you because prices can change without notice. 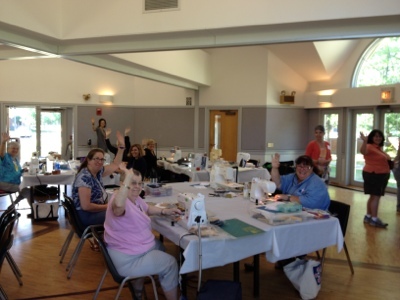 Tomorrow is my last workshop at the Vermont Quilt Festival – it’s been a great time, and I can’t wait to be back in 2015! Quipped by Bonnie K. Hunter at 10:02 PM 5 Snips & Comments by others! iPhone-o-gram! 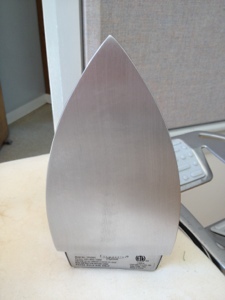 The iron I want! Vintage looking babies straight from The Vermont Country Store! 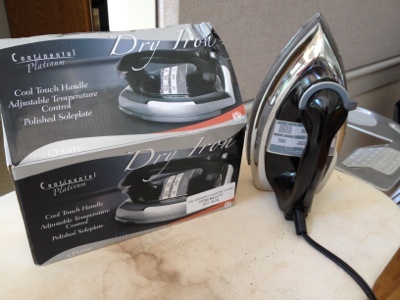 These are dry irons--extra heavy, no auto shut-off, no vent holes on the bottom to snag your fabric! The are heavy weight, get hot and stay hot! This is definitely on my want list!! Quipped by Bonnie K. Hunter at 2:40 PM 43 Snips & Comments by others! No Project photos today but you will have to believe me that we are having a great time! A new clue every 45 minutes!!??? Yes we can! There are 7 steps to this class and we need them all before we are done at 3:30pm! Quipped by Bonnie K. Hunter at 10:09 AM 9 Snips & Comments by others! Smith Mountain All Day Long! And I’m always open to suggestions on how I can do a better job, or what would have helped students more. Smith Mountain Morning is a very involved class. It’s specialty-ruler-heavy ---Easy Angle, Companion Angle, Tri-Recs --- and the way the pattern is written in the book, you find out in one paragraph on the first page that I used these rulers and 3 1/2” strips and 2” strips to do the units in the quilt. But the book also gives “regular” rotary cutting directions for those who don’t have access to these rulers. The class supply list doesn’t say to cut out the whole quilt ahead of time –and I have edited the supply list to say that there is SOME cutting that can be done ahead of time for those who want to cut --- they can come with 3 1/2” strips of blue and brown and neutral, and some 2” strips of blue and brown ---but that this is a 6 hour class, and that should be enough to get them started and keep them busy for a while. They can bring fat quarters and other yardage to cut into as time allows. My biggest fear is that someone will spend hours cutting their valuable fabric ---only to find that if they had waited for the demo they would have done it better, done it differently if they had seen the demo first. And there-in lies my quandary. How much cutting is enough? How do I give folks options without it being too much information? Do I put a warning on the class supply list --- Do not cut triangles first unless you have experience using these? I don’t want someone cutting with the stitching line as their cutting line as has happened in the past and have all of their triangles too small. I don’t want someone cutting all the regular rotary cut measurements – piles of 3-7/8” squares --- only to find that if they had waited, and tried the ruler method that they could have used 3 1/2” strips and been happier with the technique and the results. How can I be a better teacher allowing people to think things through for themselves and choose the best option that works for them? This is something I worry about all the time. There are evaluation sheets given to the students, filled out at the end of class in triplicate, and I receive my copy of each evaluation at the end of class. Of course, they are anonymous – and they can all be wonderful and praiseworthy and make me feel really good until I get to the ONE that says “Should have had better pre-cutting directions”. But there are reasons why I didn’t? But at the same time I do believe I gave it my all – and we had a wonderful time and the quilts that are coming out of this class are going to be so great! Have a super Saturday everyone! I was so excited to meet up with Lori at the awards ceremony part of opening night! The place was packed with quilters, and as always, I love people watching and seeing what quilters wear when they turn out in droves --- I saw terrific outfits, comfortable quilter’s footwear ((We all know that fashion stops below the knees!)) and the wildest array of handcrafted handbags in one location than I have ever seen in my life! I sat right down the row from my buddy Pat Sloan and her hubby, Greg –aka. “The Shipping Department”. Unbeknownst to me ---she was photographing us and tagging us on facebook ---HA! So fun to reconnect with other teachers – some I’ve met and talked with before. David Taylor and I have shared many a venue in the past couple of years, so when I was exiting the dorm as he was entering, we exchanged a few words – it’s great to see him again, I enjoy his sense of humor so much! Yesterday I grabbed a quicky lunch ---the first class was over at 11:30 – lunch was from 11:30 to 12:30 –but people were still hauling their stuff OUT of the room at 11:40 – and the people from the afternoon session were wanting to come in and set up the machines ----wait a minute! I need to get lunch in here somewhere --- so I think I got all in all about 20 minutes to wolf down my soup and salad at a little outdoor table while visiting with Pat, Sue Spargo, and Susan Brubaker Knapp who lives just down the road from me in Mooresville, NC ---the same town where I adopted Ken the Kenmore! Small world, isn’t it? The most funny of all --- I walk in last night to find Lori – and we take ONE look at each other and bust out laughing – we are dressed so much the same! White capris, black/white sleeveless blouse….it’s hysterical. And then we ask her to take it again because she has chopped our heads off…LOL! And yes, you can tell I have not been out in the sun at ALL this year – pasty white folks! But it was so good to hug my friend, walk around the show, oooh and ahhh at Gerald Roy’s collection of antique quilts ((no photography allowed…boooohooooo!!)) and enjoy the evening! And since I was never able before to send close up detail…here is a shot at the upper left corner. One of the “circles” where the blocks join together---my favorite thing about this quilt? ALL of the odd fabrics thrown together into this mess of scrappiness. So many cut off bonus triangles that have been gifted to me over the past several years have all found a place in this quilt.. The Dover Bookseller’s booth has my first three books on display front and center in their booth! But I have one up on them – I’ve got the 4th book in my classroom on campus and it is selling like hotcakes and I am so excited. Tomorrow? MYSTERY DAY!! Which means ---there probably won’t be a lot of detailed class photos for that one because --- well --- it’s a mystery! But never fear, the mystery quilt I’ve been teaching as a class since January will appear in Quiltmaker Magazine in the fall –as a NON Mystery. Quipped by Bonnie K. Hunter at 5:23 PM 18 Snips & Comments by others! Some only got one block done, but many parts well on the way for more --- some got two or three blocks done, and all will be fabulous! Quipped by Bonnie K. Hunter at 2:07 PM 10 Snips & Comments by others! iPhone-o-Gram! Sisters Choice in Action! iPhone-o-Gram! Just about that time! A Surprise Box from Ardis! Deep Down in Linville Caverns! iPhone-o-gram! More from the mountains! Rainy Day --Hanging in the Cabin! From Marcia’s Grandmother’s Scrap Bag! iPhone-o-Gram! The Waiting Room Edition! A Stay Away for Shoe Lovers! Virginia Quilting & Embroidery Conference! From the Vintage Scrap Bag! iPhone-o-Gram! Driving the long haul! iPhone-o-gram! Star Struck Group #1! Meet Me at White Turkey! iPhone-o-gram! A Lake Erie Morning! 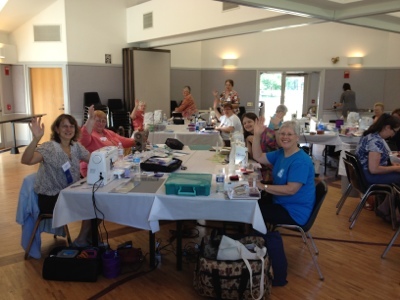 The Friendly Quilters of Ashtabula! Late Night Edition, Free Kindle Book! iPhone-o-gram! Lunch on Lake Erie! A Visit to Fabric Shack! Janice & the Fussy-Cut Hexie! iPhone-o-gram! A change of Venue! A Visit to Young’s Jersey Dairy! Jared Takes a Wife in Fairborn! iPhone-o-Gram! Fairborn, Start Your Engines! Flimsies, Fluffies & Show and Tell! iPhone-o-Gram! 100 miles to go! A Bit of Desk Distraction! iPhone-o-Gram! What's in YOUR truck?? ----And They All Fall Down! In Search of Brigitte Sieber! The 12 Hour Chicken Marathon! Crumbs and Late Night Movies!